Features: Kirkwood Mountain Biking lets you explore trails that wind through amazing terrain. 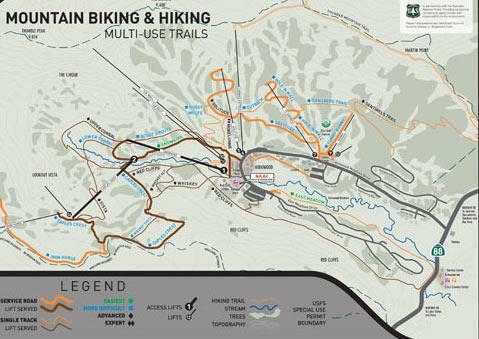 The trails are accessed by lifts and promise hours upon hours of outdoor adventure. Why We Go: Kirkwood Mountain Resort presents amazing scenery to the cyclist who is willing to go the distance and ride this mountain. The Scenery: The scenery is full of greenery around these parts. Gorgeous green trees, grassy hillsides, and plenty of snowy peaks will keep your eyes delightfully roaming all over your surroundings. The Trails: Kirkwood Mountain Resort is happy to give you choices galore with 16 different trails that you can take. Some are highly challenging while others are a breeze to ride, and you'll be able to savor the variety of many different terrain types. The Bikes: Kirkwood Mountain Biking offers high-end as well as standard performance bike rentals. Kids can take on the trails using either 20" or 24" bicycles. Some of the bicycle models available are Operator, Stinky, Tanuki, and Shred 2-0. Inside Knowledge: Kirkwood Mountain Resort has varied terrain to keep cyclists of all skill levels busy. Twenty five percent is beginner terrain, 55% is intermediate terrain, and 20% is advanced or expert terrain. Do Check Your Map: When you need to know where you're going, pull out your handy map of Kirkwood Mountain Resort. Do Stop And Smell The Flowers: Take rest breaks whenever you and your travel companions need them. You can get up close to the pretty wildflowers that are worth admiring for several moments. Don't Feel Limited: Two chairlifts (Snowkirk #1 and Caples Crest #2) give you a variety of options for getting to the mountain trails. Non-lift accessed riding is available daily. Don't Expect A Routine Workout: The exercise you'll get on one of these trails will give you lots of variety. A network of 16 trails (some single track and some dirt roads) leads you back to the base, with a ride that is as mellow or as daring as you choose. Kirkwood Lake Tahoe Mountain Bike Park is open for your enjoyment from July to September. Kirkwood Mountain Resort gives you access to incredibly scenic areas on the mountain. Kirkwood Mountain Biking offers 16 trails of varying difficulty levels.